Background: Sneezing transiently elevates cerebral blood flow. We speculated that induced sneezing, following embolism would restore arterial flow, thereby diminishing infarct volume and improving neurological deficits. Materials and Methods: Male rats were subjected to middle cerebral artery occlusion (MCAO) using prepared clots (embolization) and randomized into four equal groups as follows: (1) pre-MCAO-induced sneezing (PRMIS), (2) post-MCAO-induced sneezing (POMIS), and (3) pre- and POMIS (PRPOMIS) and the control group (eight rats per group). In the treatment groups, rats' sneezing episodes were induced before MCAO in PRMIS group or before regaining consciousness from surgical anesthesia in other treatment groups by cutting their whiskers during their anesthesia and subsequently inserted them into the rats' nostrils. Infarct volume was evaluated by 2, 3, 5-triphenyl tetrazolium chloride staining, and neurological deficits and brain edema were assessed by Bederson scale deficit scores 24-h post-MCAO. Results: The infarct volume and brain edema reduced and neurological deficits improved in the induced sneezing groups as compared with the MCAO control group. Compared to the control group, the highest improvements in the infarct volume and neurological deficits were seen in the PRPOMIS group, and POMIS group showed the most significant differences concerning the results of both ischemic and nonischemic brain edema. The highest protective effect was observed in the central region of the MCA territory. Conclusions: The reduction in ischemia-induced brain injury, brain edema, and neurological deficits by sneezing suggest that brief episodes of acute hypertension after stroke can increase blood flow to the ischemic area and improve recovery. Stroke is defined as acute focal damage to the central nervous system, divided into three categories of cerebral infarction, intracerebral hemorrhage (ICH), and subarachnoid hemorrhage. Stroke is one of the remarkable causes of disability and death in the world. The WHO definition of stroke in the 1970s has been globally accepted. The clinical symptoms are rapidly developing signs of focal or universal disturbances in the function of the brain that last longer than 24 h or even lead to death, and do not have other apparent causes other than that of vascular origin. Cerebral infarction is known to occur as focal ischemia within the perfusion territory of specified arteries due to a clot or stenosis. On the other hand, ICH can be defined as the blood accumulation in the cerebral parenchyma or the ventricles that is not caused by traumatic accidents. The ICH has a lower prevalence of embolism but higher morbidity and mortality. Stroke is a significant cause of long-term disability due to neurological impairment, and there are no broadly effective therapies to rescue neurological deficits. Sneezing increases intrathoracic and intraabdominal pressure, resulting in acute hypertension and transiently elevated cerebral blood flow. Induced sneezing in the early period, following the stroke, may be a feasible method to restore cerebral blood flow because it can be evoked reliably even in unconscious subjects. Of the numerous animal stroke models, the embolic stroke model induced by natural clots is most relevant to the pathophysiological situation in patients with ischemic stroke. Thus, we tested whether induced sneezing in rats could decrease infarct volume and improve neurological deficits, following clot occlusion of the middle cerebral artery (MCA). Animals were handled following the standards and procedures of the American Council on Animal Care. The Committee for Animal Ethics of Isfahan Medical College approved all experimental protocols. A total of 67 male Wistar rats weighing 250–300 g (Pastor Institute, Tehran, Iran) were maintained on a 12-h light-dark cycle with food and water available ad libitum. The rats were housed in standard cages at room temperature (22°C–24°C). Of 67 rats subjected to MCA occlusion (MCAO) surgery (described below), three died because of excessive bleeding. Therefore, 64 rats were equally randomized to the control MCAO group and three-induced sneezing groups, post-MCAO-induced sneezing (POMIS) group, pre-MCAO-induced sneezing (PRMIS) group, and pre-and POMIS (PRPOMIS) group (in this group sneezing was induced before and after MCAO). Eight rats from each group, i.e. 32 of 64 rats were induced with MCAO and were evaluated only for brain edema, whereas in the remaining 32 rats, MCAO was induced to evaluate the other parameters. All animals in the induced sneezing group survived until the end of the experiments. We determined the rate of arterial occlusion in different mice using laser Doppler flowmetry (Moor Instrument, England) which was borrowed from Rafsanjan University of Medical Sciences, Rafsanjan, Kerman, Iran. Previous studies have approved the Doppler laser method and explained its proficiency in determining the occlusions in the vessels., Blood was directly transferred from the femoral artery of a catheterized rat into a 20 cm length of Polyethylene-50 (PE-50) tubing and was maintained at room temperature for 1 h. We inserted a 20G cannula into the right internal carotid artery in each rat to obtain blood samples for arterial blood gas (ABG) and blood sugar analysis. We used a glucose meter to interpret blood glucose levels and evaluated ABG samples using an analyzer device borrowed from Shahid Beheshti University, Iran. The clot was then refrigerated for 22 h at 4°C before use. A 20-mm portion of the clot was cut and transferred into another section of PE-50 tubing modified to have an outer diameter of 0.3 mm, which was employed to inject the clot into the MCA. The embolic stroke model was established by directly injecting the clot into MCA. In brief, rats were anesthetized with 1.5% halothane in a 21% O2 and 79% N2 mixture. A linear incision was made in the midline of the ventral cervical skin. The right common carotid artery, external carotid artery, and internal carotid artery were exposed. The distal section of the external carotid artery was closed and cut. The modified PE-50 (Stoelting, USA) tubing containing the clot was connected to a 50-μl Hamilton lock syringe and advanced 17 − 19 mm into the internal carotid artery until the tip was inside MCA. The clot was then injected and the tubing removed. The wound was closed, and the animal was returned to its cage. Body temperature was maintained during the experiment at 37°C ± 2°C using a rectal thermometer and a heating lamp. ABG was measured in 0.2 ml of arterial blood samples taken 10 min before and after MCAO. At 24 h after MCA occlusion, animals were decapitated and brains removed. Six 2-mm thick coronal sections spanning the MCA territory were collected from each rat. The sections were incubated with 2% 2, 3, 5-triphenyl tetrazolium chloride (TTC, Merck, Germany) solution for 30 min at 37°C, followed by immersion in 10% formalin. Normal tissue is stained red by TTC, while the infarcted tissue remains unstained (white). The infarct region in each section was defined in images, and the area was quantified by ImageJ (National Institutes of Health Image, version 1.63). Total infarct volume was calculated by adding the areas and multiplying by section thickness (2 mm). Neurological deficits were assessed prior to animal sacrifice (24 h after MCAO) using the corrected 6-point scoring system of Bederson and coworkers: 0, no observable deficit; 1, forelimb flexion; 2, forelimb flexion plus decreased resistance to lateral push; 3, unidirectional circling; 4, unidirectional circling plus decreased level of consciousness; and 5, death. Cerebral edema was evaluated by determining the brain water content (BWC). At 24 h after MCAO, all rats were killed and their brains removed. These brains were divided into the right and left hemispheres comprising equal brain matrix. These hemispheres were weighted to obtain wet weight (WW) and then dried at 110°C for 24 h to determine dry weight (DW). BWC was calculated using the following formula: (WW − DW)/WW × 100. Sneezing was induced immediately after the MCAO surgery and before the rat regained consciousness. In this study, we induced the sneeze reflex in the rats by cutting their whiskers during their anesthesia and subsequently inserted them into the rats' nostrils. This method for inducing the sneeze in mice has been reported to be successful in previous studies., Each rat was closely observed and had between 15 and 20 sneezes, so the overall sneezing time lasted for 5 min. For inducing sneezing before MCAO, the rats were maintained for 1 week before MCAO in a separate chamber. In the PRMIS group, if sneezing continued until MCAO, the rats were excluded from the protocol, whereas if the number of sneezes was above 15, the rats were included in the sneezing therapy group. Data are expressed as the mean ± standard error of the mean. Infarct volumes and brain edema were compared between groups by one-way analysis of variance test. Neurological scores were reported as the mean and standard deviation (SD) and were compared by the nonparametric K independent test. A value of P < 0.05 was considered statistically significant. Physiological data are presented in [Table 1]. There were no significant changes in any of the parameters between control and induced sneezing groups (n = 8 rats per group). Furthermore, all groups revealed no significant differences before and after MCAO. Embolization of the right MCAO by injecting a premade blood clot led to infarction in the ipsilateral hemisphere, mainly in the MCA territory. The mean infarct volume was significantly lower in POMIS and PRPOMIS groups compared to the control group as measured by TTC staining of serial coronal sections (compared to the control group (42.41% ± 7.59%), the infarct volume reduced by %16.6 in PRIMS group (35.38% ± 6.62%) (P > 0.05), reduced by %26.8 in POMIS group (31.05% ± 6.75%) (P < 0.05), and reduced by %39.60 in PRPOMIS group (25.59% ± 5.68%) (P < 0.001) [Figure 1]. The infarct volumes in the cortex and striatum were also lower in the POMIS and PRPOMIS groups compared to the control group. 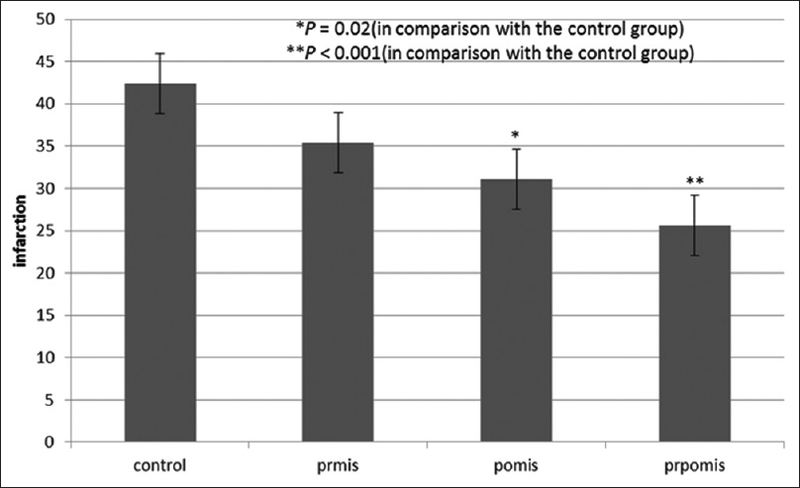 Findings of the infarct volume in cortex displayed significant difference between POMIS group (23.20% ± 5.37%) and the control group (28.27% ± 5.71%) (P < 0.05) but PRMIS group (23.58% ± 4.96%) and PRPOMIS group (18.04% ± 3.22%) did not have significant differences with the control group (P > 0.05). After evaluating the infarct volume in striatum, compared to the control group (14.13% ± 2.86%), both PRPOMIS (7.55% ± 1.82%) group and POMIS group (7.85% ± 1.96%) had significant differences (P < 0.001 and P < 0.05, respectively), but PRMIS group (11.78% ± 2.4%) displayed no significant difference (P > 0.05) [Figure 2]. Bederson neurological deficit scores were measured 24 h after stroke by observers blinded to the treatment history. 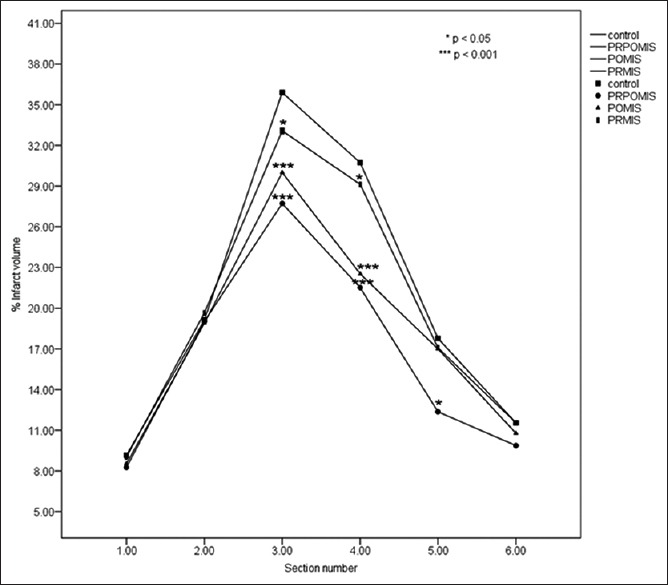 Mean and SD findings were significantly lower in PRPOMIS sneezing group compared to the control group [Table 2]. Brain edema was evaluated separately for the right (ischemic) and left (nonischemic) hemispheres. Compared to the control group (83.68% ± 0.62%) ischemic brain edema results revealed significant results in the PRMIS group (82.26% ± 0.27%, P < 0.05) and the POMIS group (82% ± 0, P < 0.001) and PRPOMIS group did not have significant difference (81.31% ± 0.28%, P > 0.05). 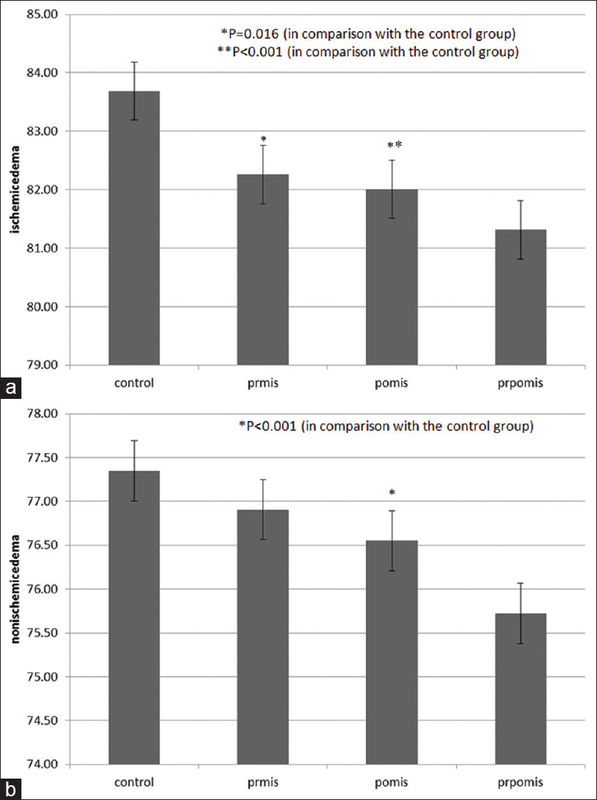 Compared to the control group (77.35% ± 0.8%), nonischemic brain edema results did not reveal significant results in PRMIS group (76.9% ± 0.55%, P > 0.05) and the PRPOMIS group (PRPOMIS: 75.72% ± 0.34%, P > 0.05), whereas POMIS group displayed significant difference (76.55% ± 0.39%, P < 0.001) [Figure 3]. The reduction in infarct area was greatest in coronal sections 3 and 4 (P < 0.001), the central area of the MCA territory [Figure 4]. 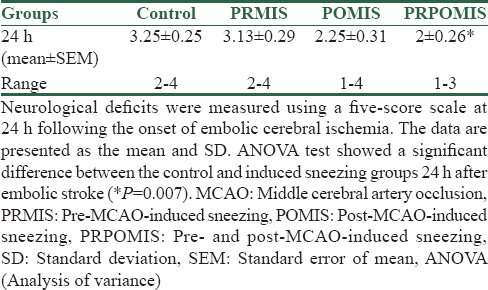 Induced sneezing immediately after embolic MCAO significantly improved neurological deficits and markedly reduced infarct volume in the central cortical MCAO territory and brain edema. During a sneeze, elevated intraabdominal, and intrathoracic pressure increases venous pressure in these regions, resulting in increased epidural venous and ICP. Arterial pressure rises with the rise in respiratory tract pressure. Besides, both diastolic and systolic arterial pressures are elevated during the Valsalva maneuver., Therefore, frequent sneezing will induce acute hypertension. We speculated that this would increase intra-arterial pressure and blood flow to the ischemic area, causing recanalization of MCA, resulting in reperfusion of hypoxic tissue.,, Cerebral blood flow and BP are reduced in ischemic areas after vessel occlusion, and there is a direct correlation between the reduction in mean arterial BP and extent of ischemic brain injury.,,, Dysfunctional cerebral autoregulation occurs after ischemic stroke., With impairment of cerebral autoregulation, cerebral blood flow is passively dependent on the mean arterial pressure; therefore, changes in systemic BP may affect cerebral perfusion, particularly in the penumbral tissues, and may affect the infarction volume and neurological deficits. However, BP acutely elevates during the stroke. Thus, elevated BP within a critical time window poststroke will increase cerebral blood flow to the ischemic area and rescue salvageable tissue. Several studies reported a temporary enhancement of BP in some cases with cerebral ischemic stroke.,, Oliveira-Filho et al. have shown that patients with good outcome had higher admission mean BP than those with poor outcome. Semplicini et al. had found that the patients with the best neurological outcome had the highest BP during the first 24 h, and the neurological outcome was dependent on the higher admission BP and better initial neurological condition. A correlation between severe stroke and high poststroke BP has been documented; however, others reported that this increased BP resulted in poorer clinical outcomes or had no significant effects. Some studies have identified a U-shaped correlation between BP and outcome, with poor outcome at either end of the BP spectrum., Cerebral blood flow in the penumbra depends on the systemic BP until the occluded artery is recanalized. There is a direct correlation between BP and recanalization, and timely recanalization improves neurological deficits. One study reported a significant reduction in BP, following successful recanalization, suggesting that poststroke BP elevation is a compensatory mechanism to accelerate recanalization. However, our study has some limitations. We did not record cerebrovascular BP during sneezing. Nonetheless, there is sufficient evidence for an increase in ICP during sneezing, and there are few other explanations for the reduced infarct volume other than the promotion of reperfusion. Additional studies are required to confirm these conclusions. The present study suggests that induced sneezing can reduce ischemic brain damage. Elevated cerebrovascular BP can improve outcomes if applied early after ischemia. Therefore, sneezing is an easily induced response that could be used for protection against brain injury by increasing blood flow to the ischemic area. This study is based on a doctoral thesis which was approved by the Vice Chancellor of Research of Isfahan University of Medical Sciences and Healthcare Services. The authors would like to thank all personnel of the Department of Physiology for their efforts on facilitating the conduction of this research. Special thanks from Dr. Pak and Dr. Taheri. The authors wish to thank the Isfahan University of Medical Sciences and Mr. Vanaie for their help and financial support. Sacco RL, Kasner SE, Broderick JP, Caplan LR, Connors JJ, Culebras A, et al. An updated definition of stroke for the 21st century: A statement for healthcare professionals from the American Heart Association/American Stroke Association. Stroke 2013;44:2064-89. Korner PI, Tonkin AM, Uther JB. Reflex and mechanical circulatory effects of graded valsalva maneuvers in normal man. J Appl Physiol 1976;40:434-40. Sandroni P, Benarroch EE, Low PA. Pharmacological dissection of components of the valsalva maneuver in adrenergic failure. J Appl Physiol (1985) 1991;71:1563-7. Smith ML, Beightol LA, Fritsch-Yelle JM, Ellenbogen KA, Porter TR, Eckberg DL, et al. Valsalva's maneuver revisited: A quantitative method yielding insights into human autonomic control. Am J Physiol 1996;271:H1240-9. ten Harkel AD, Beck L, Karemaker JM. Influence of posture and prolonged head-down tilt on cardiovascular reflexes. Acta Physiol Scand Suppl 1992;604:77-87. Kalaria RN, Akinyemi R, Ihara M. Stroke injury, cognitive impairment and vascular dementia. Biochim Biophys Acta 2016;1862:915-25. Baydin A, Nural MS, Güven H, Deniz T, Bildik F, Karaduman A, et al. Acute aortic dissection provoked by sneeze: A case report. Emerg Med J 2005;22:756-7. Mattle HP, Kappeler L, Arnold M, Fischer U, Nedeltchev K, Remonda L, et al. Blood pressure and vessel recanalization in the first hours after ischemic stroke. Stroke 2005;36:264-8. Rha JH, Saver JL. The impact of recanalization on ischemic stroke outcome: A meta-analysis. Stroke 2007;38:967-73. McManus M, Liebeskind DS. Blood pressure in acute ischemic stroke. J Clin Neurol 2016;12:137-46. Sullivan J. The Valsalva and Stroke: Time for everyone to take a deep breath. Published online at startingstrength com. 2013, September 10. Narloch JA, Brandstater ME. Influence of breathing technique on arterial blood pressure during heavy weight lifting. Arch Phys Med Rehabil 1995;76:457-62. Matsuyama T, Okuchi K, Seki T, Higuchi T, Murao Y. Perimesencephalic nonaneurysmal subarachnoid hemorrhage caused by physical exertion. Neurol Med Chir (Tokyo) 2006;46:277-81. Then R, Dominguez F, Robbins MS. Paroxysmal sneezing heralding embolic cerebral infarction. J Am Geriatr Soc 2013;61:168-9. Allahtavakoli M, Moloudi R, Arababadi MK, Shamsizadeh A, Javanmardi K. Delayed post ischemic treatment with rosiglitazone attenuates infarct volume, neurological deficits and neutrophilia after embolic stroke in rat. Brain Res 2009;1271:121-7. Rezazadeh H, Hoseini Kahnuee M, Roohbakhsh A, Shamsizadeh A, Rahmani MR, Bidaki R, et al. Neuroprotective consequences of postconditioning on embolic model of cerebral ischemia in rat. Iran J Basic Med Sci 2013;16:144-9. Dinapoli VA, Rosen CL, Nagamine T, Crocco T. Selective MCA occlusion: A precise embolic stroke model. J Neurosci Methods 2006;154:233-8. Xing B, Chen H, Zhang M, Zhao D, Jiang R, Liu X, et al. Ischemic postconditioning inhibits apoptosis after focal cerebral ischemia/reperfusion injury in the rat. Stroke 2008;39:2362-9. Allahtavakoli M, Kahnouei MH, Rezazadeh H, Roohbakhsh A, Mahmoodi MH, Moghadam-Ahmadi A, et al. Delayed combination therapy of local brain hypothermia and decompressive craniectomy on acute stroke outcome in rat. Iran J Basic Med Sci 2014;17:476-82. Vakili A, Hosseinzadeh F, Sadogh T. Effect of aminoguanidine on post-ischemic brain edema in transient model of focal cerebral ischemia. Brain Res 2007;1170:97-102. Miyazato M, Kaiho Y, Kamo I, Chancellor MB, Sugaya K, de Groat WC, et al. Effect of duloxetine, a norepinephrine and serotonin reuptake inhibitor, on sneeze-induced urethral continence reflex in rats. Am J Physiol Renal Physiol 2008;295:F264-71. Kitta T, Miyazato M, Chancellor MB, de Groat WC, Nonomura K, Yoshimura N, et al. Alpha2-adrenoceptor blockade potentiates the effect of duloxetine on sneeze induced urethral continence reflex in rats. J Urol 2010;184:762-8. Andreoli CM, Leff GB, Rizzo JF 3rd. Sneeze-induced visual and ocular motor dysfunction. Am J Ophthalmol 2002;133:725-7. Monge García MI, Gil Cano A, Díaz Monrové JC. Arterial pressure changes during the valsalva maneuver to predict fluid responsiveness in spontaneously breathing patients. Intensive Care Med 2009;35:77-84. Hilz MJ, Liu M, Koehn J, Wang R, Ammon F, Flanagan SR, et al. Valsalva maneuver unveils central baroreflex dysfunction with altered blood pressure control in persons with a history of mild traumatic brain injury. BMC Neurol 2016;16:61. Bonita R. Epidemiological studies and the prevention of stroke. Cerebrovasc Dis 1994;4 Suppl 1:2-10. Malmgren R, Bamford J, Warlow C, Sandercock P, Slattery J. Projecting the number of patients with first ever strokes and patients newly handicapped by stroke in England and wales. BMJ 1989;298:656-60. Leonardi-Bee J, Bath-Hextall F, Bath P, editors. Lowering blood pressure in acute stroke: A systematic review of individual patient data from randomised controlled trials in acute stroke. Stroke. Walnut ST, Philadelphia, PA: Lippincott Williams & Wilkins; 2004. Caplan LR, Biller J. Nonatherosclerotic vasculopathies. Caplan's Stroke A Clinical Approach. Saunders; 2016. p. 295-342. Jovin T, Caplan LR. Subarachnoid hemorrhage, aneurysms, and vascular malformations. Caplan's Stroke: A Clinical Approach. Saunders;2016. p. 439. Aiyagari V, Osman M, Gorelick PB. Neurogenic hypertension, including hypertension associated with stroke or spinal cord injury. Comprehensive Clinical Nephrology E-Book. Saunders;2018. p. 473. Shekhar S, Liu R, Travis OK, Roman RJ, Fan F. Cerebral autoregulation in hypertension and ischemic stroke: A mini review. J Pharm Sci Exp Pharmacol 2017;2017:21-7. Dawson SL, Blake MJ, Panerai RB, Potter JF. Dynamic but not static cerebral autoregulation is impaired in acute ischaemic stroke. Cerebrovasc Dis 2000;10:126-32. Eames PJ, Blake MJ, Dawson SL, Panerai RB, Potter JF. Dynamic cerebral autoregulation and beat to beat blood pressure control are impaired in acute ischaemic stroke. J Neurol Neurosurg Psychiatry 2002;72:467-72. Sugimori H, Ibayashi S, Fujii K, Yao H, Sadoshima S, Fujishima M, et al. Brain infarction developed in hypertensive and normotensive patients during hospitalization – Hemodynamic factors. Angiology 1995;46:473-80. Willmot M, Leonardi-Bee J, Bath PM. High blood pressure in acute stroke and subsequent outcome: A systematic review. Hypertension 2004;43:18-24. Leonardi-Bee J, Bath PM, Phillips SJ, Sandercock PA; IST Collaborative Group. Blood pressure and clinical outcomes in the international stroke trial. Stroke 2002;33:1315-20. Kammersgaard LP, Jørgensen HS, Rungby JA, Reith J, Nakayama H, Weber UJ, et al. Admission body temperature predicts long-term mortality after acute stroke: The copenhagen stroke study. Stroke 2002;33:1759-62. Oliveira-Filho J, Silva SC, Trabuco CC, Pedreira BB, Sousa EU, Bacellar A, et al. Detrimental effect of blood pressure reduction in the first 24 hours of acute stroke onset. Neurology 2003;61:1047-51. Semplicini A, Maresca A, Boscolo G, Sartori M, Rocchi R, Giantin V, et al. Hypertension in acute ischemic stroke: A compensatory mechanism or an additional damaging factor? Arch Intern Med 2003;163:211-6. Aslanyan S, Fazekas F, Weir CJ, Horner S, Lees KR; GAIN International Steering Committee and Investigators, et al. Effect of blood pressure during the acute period of ischemic stroke on stroke outcome: A tertiary analysis of the GAIN international trial. Stroke 2003;34:2420-5. Carlberg B, Asplund K, Hägg E. Factors influencing admission blood pressure levels in patients with acute stroke. Stroke 1991;22:527-30. Powers WJ. Acute hypertension after stroke: The scientific basis for treatment decisions. Neurology 1993;43:461-7. Vemmos KN, Tsivgoulis G, Spengos K, Zakopoulos N, Synetos A, Manios E, et al. U-shaped relationship between mortality and admission blood pressure in patients with acute stroke. J Intern Med 2004;255:257-65. Sharma VK, Teoh HL, Wong LY, Su J, Ong BK, Chan BP, et al. Recanalization therapies in acute ischemic stroke: Pharmacological agents, devices, and combinations. Stroke Res Treat 2010;2010. pii: 672064. Christensen H, Meden P, Overgaard K, Boysen G. The course of blood pressure in acute stroke is related to the severity of the neurological deficits. Acta Neurol Scand 2002;106:142-7.